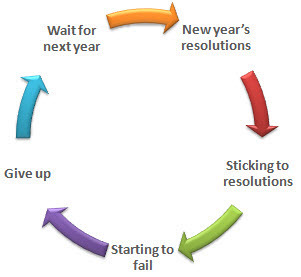 Not everyone is able to stick to new year’s resolutions, as there is a well known cycle of failure. I have assessed my resolutions to see how I am doing, and so far so good. Not doing as well on all of them as planned, but feeling rather smug as I am still going. 2. Try to make at least 1 new recipe each week. Exceeded expectations! 3. Get back into my routine for exercise. Not quite as good as planned, mainly due to working away often, but also because I have been burning the candle at both ends all year. 4. Start a new business. At least learning the skills of all things internet. You can follow my journey into the world of Search Engine Optimisation and Social Media Marketing on previous posts. 5. Write my blog more often. In progress.